VIP Express – Owen Cleaners, Inc.
Sign Up for Free Home or Office Pick Up Today! Let us come to your door twice a week. We issue you two personalized blue bags when you join. 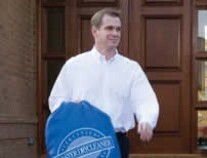 A: There is a small upfront charge to receive two personalized blue bags to join. After that it is 100% FREE. A: Yes, we require a $25 per month minimum for the free service. Q: Where do I put out my blue bag? A: Just let our delivery person know where you will place your blue bag for pickup and where you would like your clean clothes to be hung when being delivered. After the first meeting, you don’t have to be home or in the office. Q: How will I know what days you will be stopping by my home or office? A: In McCracken County, we stop by on Mondays and Thursdays. What we pickup on Monday is returned to you on Thursday. What we pickup on Thursday is returned to you on Monday. We also offer Tuesday/Friday service in Metropolis, IL. A: You just sign up for AutoPay and your orders will be charged automatically to your account. Your account is paid in full at the end of each month via credit card or bank draft. It’s your choice!